Bourke Shire is situated in Western New South Wales at the crossroads of the Mitchell Highway, Kamilaroi Highway and the Kidman Way. The township of Bourke is located on the banks of the Darling River and boasts a vibrant lifestyle and plenty of opportunities for employment. The Shire’s prosperity is built around the pastoral, irrigation, tourism and service industries and the countryside around Bourke is used mainly for sheep farming with some irrigated fruit and cotton crops near the river. Bourke Shire has a population of approximately 2900 people and covers an area of 43,000 square km. The shire is considered a gateway into south west Queensland and the far west of New South Wales and is home to many small villages including; Byrock, Enngonia, Fords Bridge, Wanaaring and Louth. Distance to Sydney, Newcastle and Wollongong: approximately. 800 km. Allow 10 hours, driving time. Dubbo is the closest largest town which is 360 km away. Traditionally a wool growing area, Bourke was once the biggest wool railhead in the world. Today, while wool is still grown, cotton has taken over as the major industry. The cotton industry is a main source of direct “on farm” employment and indirect employment through businesses established to service the industry. Bourke also boasts a thriving horticultural industry, which produces an abundance of grapes, citrus, plums, apricots and melon as well as a variety of vegetable crops. Alternative native crops such as peanuts, jojoba and the unique Napunya honey are also produced in the area. Tourism is a growing industry in the region due to the area’s natural beauty and the presence of seasonal travellers. During winter enjoy temperature ranges from about 4 degrees to 22 degrees celsius. Usually great weather during spring and autumn. Summers can be hot with 40 degree days common. During summer the heat is very dry. 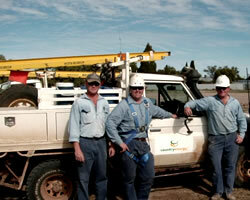 Bourke residents enjoy a generally relaxed lifestyle with close distances to work and a strong sense of community. There are many social opportunities with a busy local events calendar. Workplaces generally also have strong social networks and plenty of junior sport opportunities. Enjoy the outdoors! When it’s not too hot the river is a popular destination as is the town’s 50 metre Olympic pool. Four excellent cafes and recently upgraded pubs and clubs make a night dining out a treat, and there is camping, junior sport and team sports for adults. Housing prices range from about $100,000 for a house that might need some work to about $220,000. There is some housing available on farms and out of town. Newly constructed residential blocks have recently been made available at North Bourke. If you are looking at the potential for a new business there is industrial land available on the edge of town and larger industrial blocks available at North Bourke. Professional level jobs can often be found amongst the strong range of government services that exist in town, largely in the areas of social services but also education, environment and agriculture. Entry level jobs also exist with a strong demand for administration support and labouring type jobs. Bourke Public School, Koinonia School and St Ignatius all cater for junior schooling. Bourke High School has about 190 students offering classes from Years 7-12. Strong tourism sector with modern accommodation, caravan parks, cafes and restaurants, RSL Club. The Bourke region hosts a range of events throughout the year including the Bourke Show held in April, Louth Races in early August, Enngonia Races in early July, Back to Bourke Reunion Weekend held over Easter and market days each season at the wharf. Bourke has a wide range of attractions for locals and visitors alike. 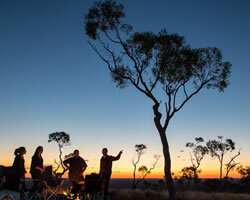 Cruise the Darling River on the PV Jandra paddle boat, dine out under the stars at Poetry on a Plate or explore the diverse cultural story of the region by visiting the Gundabooka National Park. Bourke has plenty to discover. $143.25 million to the Orana region GRP.